World news material: is deceit the name of the game? Which part of the brain is in charge of this mess? Opening their newspaper or laptop this morning, readers were fed the same usual type of story. In China, police snatched around 20,000 tons of counterfeit meat (rat, mink, fox), of meat injected with water or chemicals and diseased flesh. In Toronto, 3 pastors were charged of defrauding their congregants of $8.6 million. In Israel, Syria is believed to endanger national security: USA considers Israel might have conducted an airstrike into Syria as 16 of their planes violated Lebanon airspace yesterday. In all these, what is the common, initial culprit? Deceit. From which part of the brain does deceit emerges from? Therefore, if we deprive a group of their culture and prominent religion as we are now doing by trying to wholly replace these with what we name science and capitalism, without underlining the universal aspect of these, we open the door to generalized deceit. Society will not flourish and everything will collapse. In the same manner, corporatism, untamed by universal ideals falls under the dominance of deceit-for-profit at all levels. The true function of the head of government is therefore not only to manage the self-interest of a nation but also to underline and follow universal ideals which will then be in control of inflating individual self-interests. No country can survive alone, we have all learned this. As an example, what one country does to its environment affects us all. How do we get out of this guetapens we did set for ourselves? 1 1) Instill universal ideals to our youngsters: a respect and love for humanity as a whole, a respect and love for nature and the environment. U 2) Understand how the brain functions and what the model behind it is. This model was intuited upon by many people through the ages. David Bohm, the quantic physicist and protégé of Einstein named it “the implicate order”. Most ancient traditions were based on this model. 3) Modify the structure of our governments so they mimic more closely the functioning of a healthy brain: one which expresses this model with all its aspects expressed and working harmoniously. 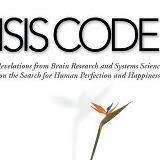 The newly released book Isis Code, analyses this model and applies it to the brain. The author, Ariane Page, shows how recent brain researches agree with this perennial model. Ariane Page is a consultant in LIFE biosystem applications and wrote Isis Code Revelations from Brain Research and Systems Science on the Search for Human Perfection and Happiness. She can be contacted at info@IsisCode.com . Her website is www.IsisCode.com and she is also on facebook Isis Code /facebook.